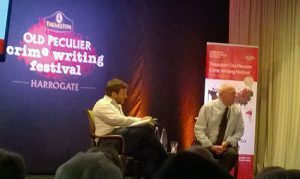 Whether you are a crime writer or a crime fiction fan Theakston’s Crime Writing Festival is the place to be at the end of July each year. For a few days Harrogate, a normally civilised, understated spa town in North Yorkshire, becomes the beating heart of all things criminal. 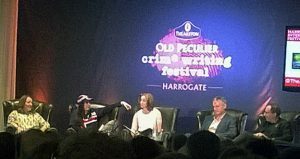 Of course Harrogate was famous for its crime writing connections long before Theakston’s Festival was a twinkle in the organising committee’s collective eyes. It was there that Agatha Christie was eventually discovered after she disappeared without a trace in December 1926. A police manhunt lasted eleven days before she was finally spotted by a banjo player at the Old Swan Hotel. These days Agatha would find it distinctly more difficult to go unnoticed at the Old Swan. With 15,000 people, including some of the best loved names in the crime writing world, attending this year’s Festival somebody would certainly spot her. And one thing is for sure she wouldn’t be allowed to sit quietly by in a corner. Here you’re just as likely to find yourself chatting to authors such as Peter James, Natasha Cooper, Mari Hannah, Elly Griffiths or Val McDermid, as you are to a fellow fan. For people who spend their lives alone in small rooms devising ways to bump people off and dispose of their mortal remains, crime writers are a surprisingly approachable bunch. 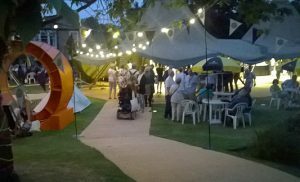 There’s always so much going on at the Festival, which runs from Thursday evening to Sunday afternoon, that it’s difficult to pick out highlights. But two of mine are Val McDermid’s Outstanding Contribution to Crime Fiction Award and her Friday night interview with Susan Calman. The first brought the entire house to its feet and the second reduced most of the audience to tears (the laughter must have been heard on the other side of Harrogate). As you can see the place was packed for Val and Susan’s panel. Few of this year’s panels can have covered quite so much ground as You Couldn’t Make It Up. Or Could You? chaired by Sharon Bolton with Peter James, Mari Hannah, Yrsa Sigurðardóttir and Graham Bartlett. The range of inspiration that the panellists drew on said something for the breadth of the crime writing community and the diversity of crime fiction. The conversation ranged from elves and their influence on Icelandic life (no really), through the hard won experience of working as a probation officer, to the realities of life as a police officer and why the world’s worst bank robber carried his bicycle seat with him. Icelandic author Yrsa proudly sported her country’s football shirt! I attended a crime scene brought to life from The Moth Catcher novel by Ann Cleeves, in Pan Macmillan’s Would you make a good detective? A fascinating forensics and crime scene experience, I also got to don a Tyvek body suit, mask and gloves in 26C+ degree heat! I really enjoyed trying my hand at 21st century crime scene forensics with the pros, before stepping back into the 20th century to consider the Legacy of the Golden Age [of crime fiction] with Simon Brett, Catriona McPherson, Susan Ware, Frances Brody and Ann Granger. For me the most compelling session was Gerald Seymour in conversation with Joe Haddow. The publication of Gerald’s first thriller Harry’s Game was truly ground breaking. Quietly spoken and unassuming it was obvious from the moment that he began to speak that he had a gift for the telling of tales. His years as an ITV correspondent covering stories around the globe provided a fertile breeding ground for his extraordinary and productive imagination that has so far created no less than 32 books. His approach and his insights were an inspiration. I only managed to be there from Thursday to Saturday, but whether you come to the Festival to be entertained, to learn, to meet up with old friends or to make new ones – you won’t be disappointed. It would be a crime to miss it.